Every year all of the “biggie” growers, Proven Winners, Terra Nova, Monrovia and Bailey… introduce new plants for home gardeners. This year Terra Nova, the “Heuchera Kings”, are introducing Heuchera ‘Glitter’, a striking perennial with mirror bright leaves and black veins. They are also introducing a series of three Begonias called ‘Garden Angels’ with metallic blush, plum and silver leaves. Proven Winners is introducing blue-leaved, Spiraea ‘Blue Kazoo’, a compact 2 to 3 foot shrub with large white flowers, resistant to deer and attractive to hummingbirds. Monrovia is mass marketing Wisteria machrostachya ‘Blue Moon Kentucky’ that has 12” racemes and blooms 3 times per year. Bailey has many new introductions but one of the most striking is the new Astilbe x arendsii ‘Color Flash’. The South Sound is perfect for Astilbe since they like moisture and semi shade. This one does extra duty. Leaves emerge green and mature to purple, burgundy and green setting off its pink spikey flowers. You can go to any of these websites to be completely overwhelmed by what they will be offering. All of the major nurseries in the South Sound are supplied with plants from at least one of these major growers. And, as always, don’t forget the little guys, the independents. We have amazing small growers in the area who supply the smaller nurseries with plants you won’t find in mass markets. We’ve gone from McMansions to Pod Houses and Hummers to Minis so it’s only fitting that gardens are being scaled back to look more personal…more intimate. This trend doesn’t mean fewer plants it means more thoughtful designs. That’s why this year’s Northwest Horticultural Society’s Annual Symposium theme at Bastyr University is “Small Space—Big Impact”. The symposium is Saturday, March 22 for the day. More information can be found at www.northwesthort.org. Garden is Full? Go up! Plastering an outside wall of a house, garage or shed completely with plants sounds pretty drastic and unless you really plan ahead or just use succulents it’s pretty labor intensive and high maintenance. If you would rather not succumb to the solid wall method there is an alternative. Burgon and Ball, Britain’s premier home garden supplier has created a scaled down version that makes the process less daunting. They created vertical wall planters made from dirt brown (not bright green), heavy duty nonwoven material (not plastic) with built-in deep pockets that makes planting and watering easy. Find them at www.gardenshoponline.com . Two 12”x25” wall planters for $25. 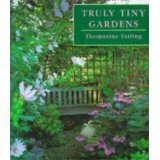 Thomasina Tarling (yes, that’s her real name) wrote “Truly Tiny Gardens” in 1995 when the trend was “bigger is better”. The 96-page book was ahead of its time, well received but not current with the big leaved, big garden fad of the 90’s. She wrote the book with a particular London garden in mind…hers. Now that “small is in” I suspect her book will be reprinted. Whether you have a large garden with small garden rooms or a patio, terrace, porch or roof begging for some plant life, you’ll find common sense tactics for creating a beautiful area in a small space. Designing in small spaces is tricky especially if you’re a plant nut. This is not a book about miniatures; it’s a book about the clever use of space. “Truly Tiny Gardens” may be out of print but you can still find it easily. For now, you can go to the usual outlets and buy it for a rock bottom price. This entry was posted in Garden News by Vickie Haushild. Bookmark the permalink.